We're joined today by our Roman guide Dino. Dino recently topped our lists for the Most Popular ToursByLocals Guide of 2017 - he gave 225 tours to travellers this year! He's taken some time out of his busy schedule to tell us about an archeological site near Rome that not everyone's heard about. As Dino explains, a visit here provides a fantastic half-day excursion from Rome, and will leave you with memories that linger much longer. 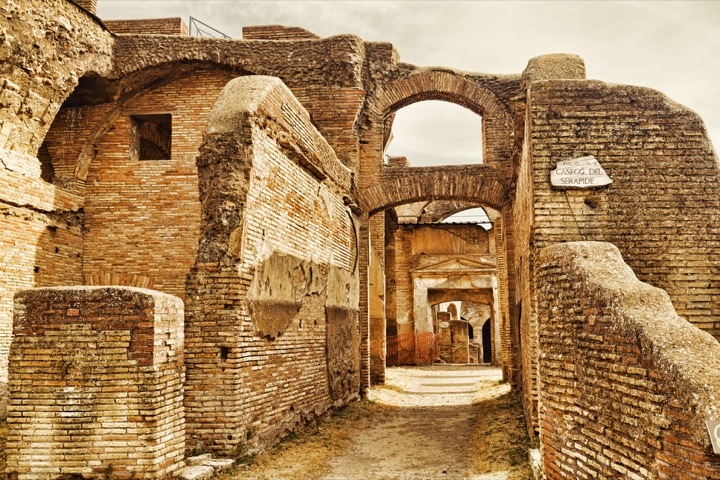 You have probably seen the Vatican Museums, Trevi Fountain, the Spanish Steps or the Colosseum but maybe you don't know that near to Rome there’s an impressive archaeological area just like Pompei but much less crowded: its name is Ancient Ostia (Ostia Antica). It’s one of Italy's most interesting, largest and best-preserved archaeological areas, recommended even by Rick Steves (America's leading authority on European travel). This place should be on everyone’s bucket list. Today I want to introduce you to this magical site, located only twenty miles (30 km) from Rome, especially for those who - during their stay in Rome - have not enough time for getting to the better known site of Pompei, which is more than 3 hours south of Rome! Ostia was the first Roman colony and it was founded around the 4th century BC as a “castrum”, (fortified camp) to protect the coastline but quickly became first and foremost the seaport of ancient Rome and afterwards, from the 1st century AD, a bustling commercial town and the storage center for Rome’s grain with people from all over the Roman Empire. The name means the “mouth” of the Tiber river, because originally it was on the Mediterranean coast, and now lies about 4 miles (6 km) from the sea due to the distance created through time by silting and a drop in sea level. During its hey-day, Ostia was a very cosmopolitan city, a mix of “international” population of approximately 75,000 inhabitants accommodated by “insulae”, multi-storied tenement complexes, where especially the lower middle-class lived, with floors paved with mosaic and walls elaborately painted. Wandering its ruins and walking through the cobbled-stoned streets, you find the remains of an impressive variety of well-preserved buildings (public bath complexes, houses, bakeries, pagan temples, store buildings, taverns, latrines and even a magnificent theatre, one of the oldest brick ones anywhere, still used for concerts today). All this variety is a sign of Ostia’s wealth and prosperity, which was reached in the early 2nd century AD. You can see many traces of frescoes on the walls, marble decorations, millstones from bakeries - but one of the most distinctive features of Ostia are its beautiful black-and-white mosaics that you can discover everywhere. Discovering Ostia is like visiting a microcosm of the Roman Empire! This magical place is open almost every day of the year, except Mondays, December 25th, January 1st and May 1st. I strongly recommend this perfect half day tour from Rome for those who want to take an impressive journey back to the past not only to understand the daily life in the Roman Empire but also to have the feeling that the clock has been turned back nearly 2,000 years! Want Dino to bring Ostia's Roman history to life for you? Send him a message, or simply book the tour before this popular guide is booked by someone else!